Latest in my Femina column is my article on Amritsar. Amritsar is a city whose people love to eat and live to eat. Dropping in there is a good way to get an introduction to Punjabi food which defines ‘Indian food’ to the world. I relived every Bollywood cliché in my recent trip to Amritsar. Right from the green fields where our plane landed to the big hearted, fun loving Punjabis whom I met. 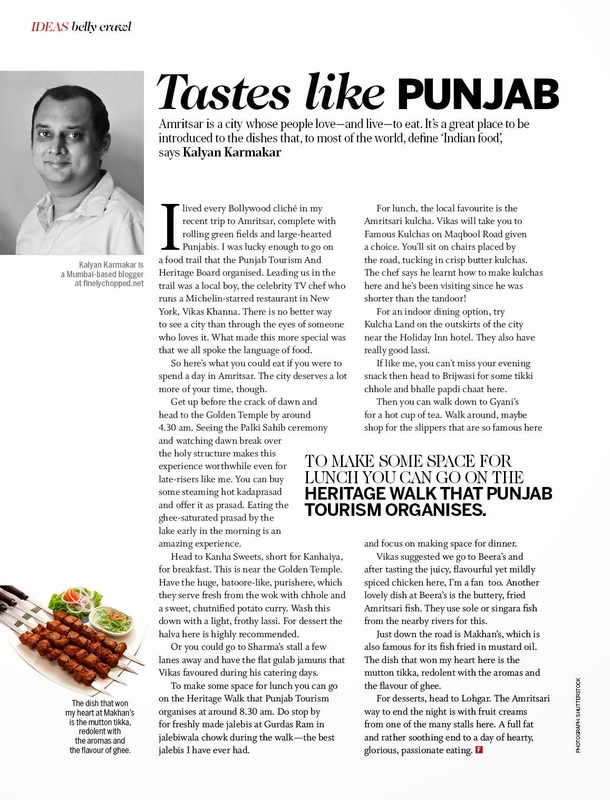 I was lucky enough to go on a food trail that the Punjab Tourism and Heritage Board organized. Leading us in the trail was local boy, the TV celeb chef who runs a Michelin starred restaurant in New York, Vikas Khanna. There is no better way to see a city than through the eyes of someone who loves it. What made this more special was that we all spoke the language of food. So here’s what you could eat if you were to spend a day in Amritsar. The city deserves a lot more time though. Get up before the crack of dawn and head to the Golden Temple by around 4.30 AM. Seeing the Palki Sahib ceremony, and watching dawn break over the Golden Temple, makes this an experience worth it even for late risers like me. You can buy some steaming hot kada prasad and offer it as prasad. Having the ghee shrouded prasad by the lake early in the morning is an amazing experience. Head over to Kanha Sweets, short for Kanhaiya, for breakfast. This is near the Golden Temple. Have the huge, near batoore like, puris here which they serve fresh from the wok with chhole and a sweet, chutnified, potato curry. Wash this down with a light, frothy lassi. For dessert the halva here is highly recommended. Or you might go to Sharma’s a few lanes away and have the flat gulab jamuns that Vikas Khanna used to order during his catering days in Amritsar. This is a stall by the wall. To make some space for lunch you can go on the Heritage Walk that Punjab Tourism organizes at around 8.30 am. Do stop for freshly made jalebis at Gurdas Ram at jalebiwala chowk during the walk. These are probably the best jalebis I have ever had. When the question is lunch then the answer is Amritsari Kulcha here. Chef Vikas Khanna will take you to Famous Kulchas at Maqbool Road given a choice. You sit on chairs placed by the road and have crisp butter kulchas here. Chef Vikas says he learnt how to make kulchas over here and that he used to come here from a time when he was shorter than the tandoor! Another nice place for kulchas is Kulcha Land in the outskirts of the city near the Holiday Inn hotel. They have indoors seating here along with seating on the pavement and some lovely lassis are on offer as well. If like me, you can’t miss your evening snack then head to Brijwasi for some tikki chhole and bhalle papdi chaat here. Then you can walk down to Gyani’s for a hot cup of tea. Walk around, maybe shop for slippers which are famous here, make space for dinner. Chef Vikas Khanna insisted that we go to Beera’s for dinner. After having the juicy, flavoursome and yet mildly spiced chicken here I too am sold on the place. Another lovely dish at Beera’s is the buttery fried Amritsari fish. They use sole or singara fish from the nearby rivers for this. Just down the road is Makhan’s which is also famous for its fish fried in mustard oil. The dish that won my heart here is the mutton tikka, redolent with the aromas and flavours of ghee. For desserts head to Lohgar. The Amritsari way to end the night is to have fruit creams from one of the many stalls here. A full fat and rather soothing end to a day of hearty, glorious, passionate eating. Best followed by a good night’s sleep flavoured by delicious dreams of the food of Amritsar. This is a very good n informative article on amritsar for ppl like us who havent visited d place yet.addressing celeb chef vijas khanna as a local boy of punjab sounded very sweet n adorable.